Welcome to Peak of Serenity’s Atal’Dazar dungeon guide for Brewmasters! Atal’dazar, the golden temple and resting place of Zandalar’s kings was the first dungeon players were able to visit in Battle for Azeroth’s initial reveal. Because of this, it has become quite polished and remains a tight experience while still allowing for some flexibility in its routing. 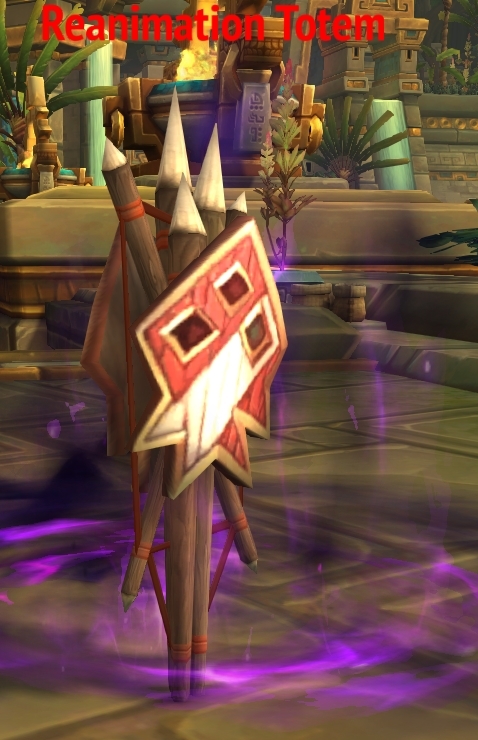 As with most other Zandalari dungeons in Battle for Azeroth, Alliance players must be level 120 before being able to enter, while Horde players have immediate access at level 110. And remember, if looking for a particular section in this dungeon or want to know more about talents, feel free to use the sidebar or consult our Brewmaster guide! The entrance to Atal’Dazar can be found on the western end of the Zuldazar. Both factions have flight points that will drop them off near the entrance. Yazma, the spymistress of Zandalar, has plotted with the prophet Zul to overthrow King Rastakhan and has stolen the souls of the Loa Shadra and Rezan. She guards Atal’Dazar to prevent players from reaching Zul as he plans to enter King’s Rest and revive Dazar, The First King in the name of the old god G’huun. Atal’Dazar is a somewhat special dungeon in that there are multiple paths through it! The only constant in it is that Yazma must be slain last, otherwise players are free to roam around as they see fit and kill the remaining three bosses in any order. That being said, over time players have found a path that avoids some of the most dangerous trash this dungeon has to offer (particularly the southeast path to Priestess Alun’za). This is the route that is shown above and will be broken down step-by-step. Note that if doing this dungeon in mythic plus, this route will not grant the required trash percentage without killing a few extra mobs along the way. As for checkpoints, there are none. From the entrance, mount up, run along the path straight ahead, and jump off. If this is done immediately after starting a keystone run or zoning in, Rezan will be walking directly in front of you, waiting to be pulled. None! There is no required trash on the way. Rezan is a relatively straightforward boss, made even more trivial with the help of Summon Black Ox Statue. His moveset consists of using Terrifying Visage followed by Pursuit and, if he reaches his target, Devour. The main twist comes in the piles of raptor bones scattered throughout the arena. If a player–or Rezan himself in Heroic/Mythic–runs over them, they are snared by the pile of bones and summon a Reanimated Raptor. These additional mobs only melee, but hit hard. Finally, Rezan applies Serrated Teeth to the tank in between uses of visage and Pursuit. Consider setting up an emergency Transcendence in a safe spot! When it comes to Pursuit, it’s often easier to stay by the stairs and let Devour be cast if your healer is able to keep up with the damage. On higher tyrannical keys, this will not be feasible without heavy damage reduction cooldowns. Summon Black Ox Statue makes it easy to gather up any reanimated raptors and keep them off of you while suffering from Serrated Teeth. Alternatively, have Guard or Dampen Harm ready for Serrated Teeth. After slaying Rezan, proceed up the stairs and back near the entrance before taking a left. Be careful to run along the balcony here so as to avoid pulling excess trash. If a rogue or demon hunter is in your party, you may Sap or Imprison the Zanchuli-Witch Doctor just before the stairs to Vol’kaal to skip that pull (large mounts may still attract nearby enemies). Shadowblade Stalker; four of these enemies await in stealth along this route. One at the start, one in the middle, and two near the end. They will open with Waylaying Jab if not destealthed and can cast Venomfang Strike to make the target take 100% more nature damage. This is a poison debuff that Monks can dispel with Detox! Reanimated Honor Guard; these hulks cannot be harmed without killing the nearby reanimation totems. Once the totems are destroyed, watch your feet for Rotting Decay and the gaurd exploding on death after a short delay. Shieldbearer of Zul; skeletal trolls brought back to serve. Their Shield Bash interrupts (watch your Chi Burst cast) and Bulwark of Juju provides hefty damage reduction to any allies in its range. Use Leg Sweep or Paralysis to stop the channel entirely, or knock them away (without stopping the channel) with Ring of Peace. Zanchuli Witch-Doctor; a classic troll caster. Venom blast HURTS–especially on fortified weeks–but often targets dps instead of tanks. Unstable Hex (interruptible) will attempt to spread to nearby players as it expires and is a curse debuff. Vol’kaal may have been raised from the dead, but has been made vulnerable by three Reanimation Totems chaining him to life. Until players kill all three of these totems he will be immune to damage and will only use Toxic Leap and Noxious Stench (interruptible). After all three totems are slain–within 10 seconds of each other on Heroic and Mythic–the boss will only use melee and Noxious Stench while spreading Toxic Pools around the room as he begins to Rapidly Decay. Keep track of how much health each totem has. If any totem finishes its Reanimate cast, this fight will take much longer than it needs to complete. Take note of where Vol’kaal is at all times, as he could start channeling Noxious Stench while running back after a Toxic Leap. Lingering Nausea, the stacking dot effect applied by Noxious Stench, is a disease that can be dispelled with Detox! Make the most of the room as you begin to damage the boss while dodging Toxic Pools. Backpeddling around the perimeter sets an ideal pace to stay safe as you slay him. Head down the stairs and open the gate with the lever at the bottom. While running through the middle section, be careful not to pull Dinomancer Kish’o, Monzumi, or T’lonja by skirting around the center platform. When running up the stairs to Alun’za, be mindful of the fire traps on the walls. They will deal EXTREME damage to players that wander into their path. Pull at your own peril. Toxic Saurids; these little fiends often leap out to other players before running back and are a low priority. Feasting Skyscreamer; this discount pterodactyl has a hefty six second fear (Terrifying Screech) that must be interrupted. Attempting to stun (Leg Sweep) or crowd control (Paralysis) this mob mid-cast will only make it try again the first opportunity it can. Dinomancer Kish’o, Monzumi, and T’lonja. Avoid pulling this trio at all costs. While they give a hefty amount of trash percentage in mythic plus, their abilities, health, and damage dealt generally outweigh this usefulness. T’lonja will stun players with Frenzied Charge, Kish’o will attempt to cast Dino Might (interruptible), and Monzumi will cast Wild thrash. Dazar’ai Juggernaut; while not dangerous on their own, these mobs can enrage and charge to players. Dazar’ai Augur; perhaps the second most dangerous enemy in the dungeon, these casters will apply a (dispellable) dot with Wildfire, but more importantly will channel Fiery Enchant which is incredibly hard to dodge if not interrupted. Gilded Priestess act as a tutorial to Alun’za by creating Tainted Blood pools on the ground and channeling Transfusion on a player. If the target steps into a Tainted Blood pool during the cast, the priestess will hurt herself rather than heal. Dazar’ai Confessor and Colossus; while not directly on this path, they are nearby and worth mentioning. Confessors will attempt to heal targets with Mending Word (interruptible) and create an area where allies cannot be stunned, crowd controlled, or interrupted through Bwonsamdi’s Mantle (interruptible). The Colossus, meanwhile, acts as an enemy with its own Bolster effect via its passive, Soulforged Construct. These two enemy types are why the path that goes by them in the dungeon is often ignored. Stand in Tainted Blood during or just before Transfusion to prevent Alun’za from healing. with Gilded Claws and random dps with Molten Gold while summoning Tainted Blood pools. In addition, on heroic and mythic difficulties players also must avoid running into balls of corrupted gold–or suffer 30% reduced damage from Corrupted Gold–while slaying a Spirit of Gold that spawns on the altar and attempts to run over the blood pools. Why is this bad? Alun’za‘s primary mechanic is to channel Transfusion on the entire group to heal herself. If players stand in the blood pools shortly before or during this cast, she will instead greatly harm herself. Keep Alun’za near the altar where the Spirit of Gold will be spawning. These spirits are fully susceptible to stuns (Leg Sweep), snares (Keg Smash), knockbacks (Ring of Peace), and crowd control (Paralysis), so they should be easy to manage if properly targeted. Gilded Claws isn’t as dangerous as it sounds to a Brewmaster. Make use of Transcendence and your mobility with Roll and Tiger’s Lust/Chi Torpedo to get to the Tainted Blood pools that are too far for most melee to reach. Avoid the balls of Corrupted Gold at all costs. After slaying Alun’za, backtrack down the stairs (watch out for the still active fire traps and Dinomancer Kish’o) and take the remaining path to Yazma‘s overlook. On your way up to her, watch out for the spiders wandering down the stairs. None! You’ve killed or avoided everything already. Having stolen the power of the spider loa, Shadra, for herself, Yazma has gained a new form and deadly shadow abilities to match. She will alternate between trying to cast Wracking Pain (interruptible) and using Skewer on the tank. Upon reaching full energy, Yazma will then cast Soulrend on everyone but the tank (only one target in Normal). Targeted players must stack up at a spot away from Yazma and kill the Soulspawns created at their location before they reach the boss, lest they trigger a Soulfeast. Finally, Yazma will periodically summon Echoes of Shadra that alternate between fixating their target and wandering aimlessly. Place a world marker down so players know where to stack while moving Yazma away from any Soulspawn that comes close. Soulspawn are fully controllable, so Ring of Peace can be a viable option while Leg Sweep may be too risky. Be ready to use a Guard or Dampen Harm–if talented–against a Skewer being cast while you are low on health. Echoes of Shadra are immune to stuns, snares, knockbacks, and cc, but may be detonated safely by a tank with damage reduction or a player with an immunity/magic defensive. Alternatively, stay as a group and slowly move the boss around the room so that the echoes stay stacked up.